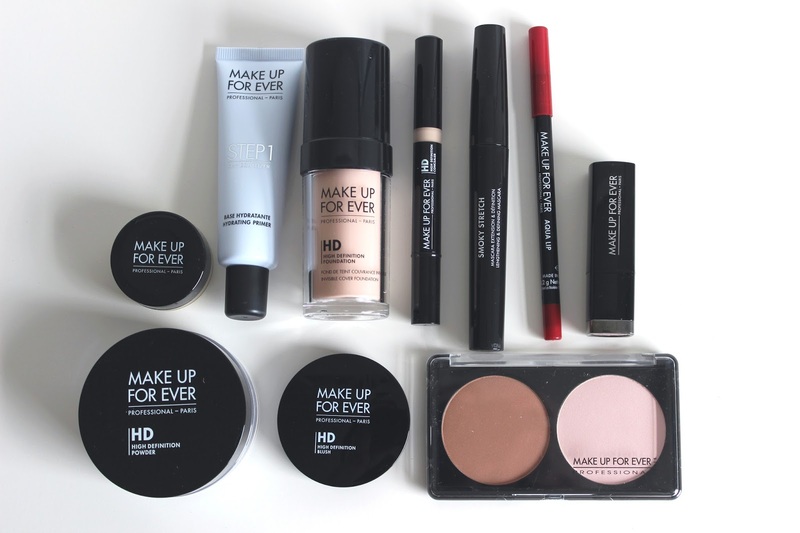 On Wednesday 8th July, me and Chloe headed to the newly opened MAKE UP FOR EVER counter in Debenhams Birmingham for our makeovers which were kindly booked for us. I’d heard amazing things about the brand and their make up so I was so excited to try them out. The counter is actually in a little section of its own, which I think is perfect as you can really get the feel for this professional brand. The artists in there are so lovely and it’s nice to feel welcome when you go to a make up counter, as it’s not always the way. Each product is made for use in the professional industry, so you’re guaranteed amazing quality! The lovely Neve led me over to the chair where we started discussing what sort of make up look I like to wear. I explained that I love a red lip and some winged liner – but that I cannot do liner to save my life. Firstly the hydrating and matte primers were applied onto my face. The hydrating one around my nose piercing because it is super dry at the moment. Then she went onto my eyes, where she applied the famous MUFE Aqua Cream and shadows in ME514 and D712 to create a gorgeous neutral eye. Loose glitter pigment was also applied over the top for a bit of shimmer. Neve applied Aqua Brow to my eyebrows, making them look sharp but natural, exactly how I like them. She highlighted them with a bit of concealer, which made them look so defined it was incredible! With my face, the HD concealer and foundation were applied and oh my god they photograph so well! The brush Neve used to apply my foundation also was amazing, it literally buffed for you so you barely had to do any of the work. After the foundation and concealer, contour was applied with the sculpting kit. It was such a lovely colour on my pale skin! Then Neve applied a gorgeous cream blush, which I’m not usually a huge fan of but this one was gorgeous. The Ink Liner was used for my eye liner and literally I wish I could pay Neve to do my eyeliner every single day. She perfected it, I could never ever do liner that well. I was sad to have to take it off when I went to bed that night! The look was finished off with the Aqua Lip Pencil and Rouge Intense Lipstick. The shade of lipstick used was stunning and I could not stop looking at my make up for the whole night. I was sent the majority of the products from my makeover to try at home. So far from my makeover I think they’re all amazing. I’ll be doing more thorough reviews of the products over the coming months, so watch out for those. I’m so grateful for being sent these and for the fabulous makeover! Thanks again to the gorgeous Neve! What’s your favourite part of the look?